From Pinneys of Orford, Woodbridge, Suffolk. 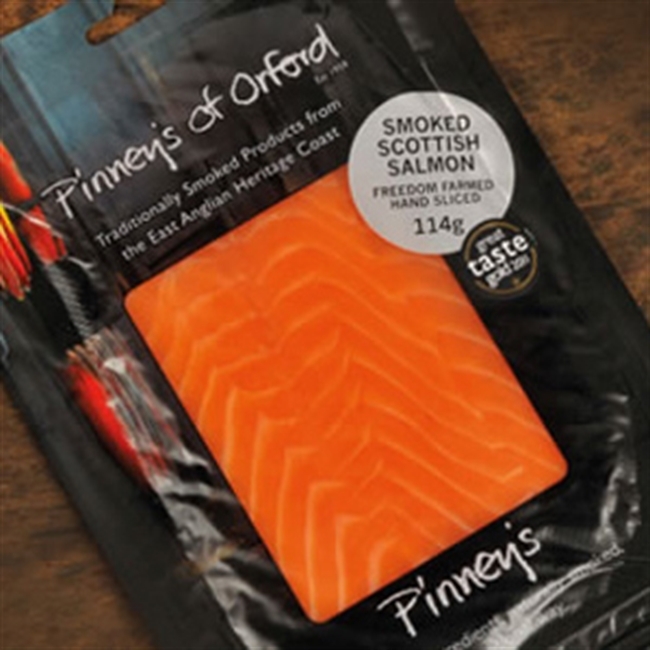 Beautiful smoked Scottish salmon that has been carefully sliced by hand. Perfect for topping a toasted bagel or stirring through pasta with cream cheese, lemon juice and dill for a simple supper. All of Pinneys Salmon comes from Wester Ross, one of the oldest independent salmon farms in Scotland. They rear their salmon to RSPCA & Freedom Food standards, meaning they have very low stocking densities, ensuring happy, healthy growth. The salmon are hand fed locally caught fish, both reducing waste and ensuring that no foreign elements are introduced into the local ecosystem. Available in approx. 150g portions, Wester Ross Salmon is a sustainable alternative to the dwindling salmon stocks of the Atlantic and Pacific.